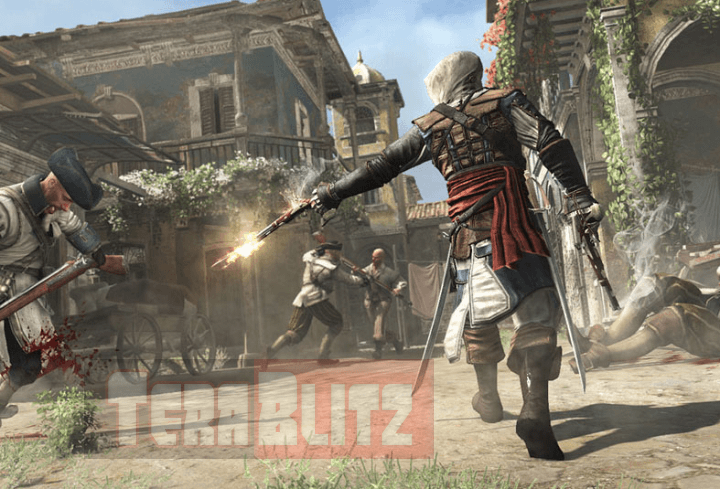 PC Cheats for Assassin’s Creed 4: Black Flag are listed here for archiving and recording purposes. AC4:BF is an action-adventure video game which Ubisoft released on November 2013 for Windows. 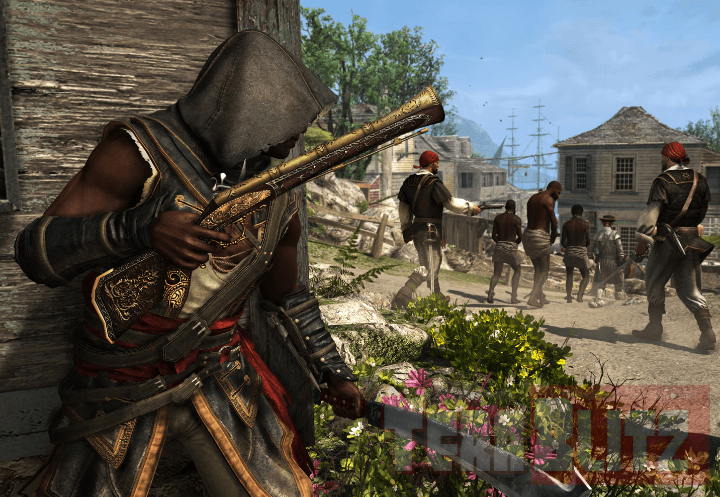 Cheats for Assassin’s Creed 4: Black Flag require extra effort from the player to unlock certain abilities and items. It demands that the player achieve certain milestones and finish any related game missions. Complete the tasks required to unlock the related cheat under the Cheats Option included in the menu of Abstergo Challenges. Tip: Using Cheats prevents you from getting the corresponding Achievements and your game from being saved. Complete 90 Abstergo Challenges. This cheat gives unlimited ammunition. Complete 20 Abstergo Challenges. This cheat allows pirate speak for Edward. Complete 10 Abstergo Challenges. This cheat allows time to be set and locked. Complete 70 Abstergo Challenges. This cheat provides invincibility for Edward and the Jackdaw. Complete all 100 Abstergo Challenges. This cheat allows skeletal crew. Complete 50 Abstergo Challenges. This cheat makes Edward always drunk. Complete 30 Abstergo Challenges. This cheat prevents Edward and the Jackdaw from regaining health. Complete 60 Abstergo Challenges. This cheat allows sea wave intensity to be set. Complete 40 Abstergo Challenges. This cheat allows always maximum wanted level. Complete 80 Abstergo Challenges. This cheat changes enemies into strange creatures. Altair’s Robes: Have a saved game file from Assassin’s Creed, and an internet connection to retrieve the costume. Alternately, have that game played on your Uplay profile. Connor Kenway’s outfit: Have a saved game file from Assassin’s Creed 3, and an internet connection to retrive the costume. Alternately, have that game played on your Uplay profile. Ezio Auditore’s Robes: Have a saved game file from Assassin’s Creed 2, Assassin’s Creed: Brotherhood, or Assassin’s Creed: Revelations, and an internet connection to retrive the costume. Alternately, have one of those games played on your Uplay profile. Explorer outfit: Complete Community Challenge #6. Community challenges will randomly appear while online. Governor’s outfit: Find and share a social chest. Social chests will randomly appear while online. Officer’s outfit: Complete the “Great Reputation 1” trading mission to Gibraltar with Kenway’s Fleet (Mediterranean Sea mission). Stealth outfit: Complete 50% of the Assassin Contract side quests. It decreases visibility and improves stealth. Templar Armor: Complete all Templar Hunt side quests, then open the cage in the Great Inagua hideout using the five Templar keys. It provides 25% damage reduction. Politician’s outfit: Purchase for 12,000 R.
Proceed through the main missions until you have access to Sequence 2: Memory 3. Proceed through Sequence 2: Memory 3 until you reach the area where the three templars are standing around a table. The “Pickpocket All Templars” optional objective will appear while standing next to them. Pickpocket all three templars, then pause the game and select the “Reload Last Checkpoint” option. The money you pickpocket from the templars will be saved, and you can pickpocket them again. Repeat this process as many times as desired to get an unlimited amount of money. You can get approximately 35,000 R every seven minutes using this glitch. You can use the money earned from this glitch to easily buy all weapons and gear in the game. Tip: You can load any sequence and memory you have completed throughout the game, allowing you to use this trick at any point once you have access to the specified sequence and memory. Additionally, this glitch was done on an unpatched version of the game. After the patch has been applied, the glitch can still be used if done once you reach Sequence 2: Memory 3, but it cannot be done after completing the memory. You can delete all patches for the game by using the “Clear hard drive cache” code for the Xbox 360. Tip: This trick requires a decent amount of hull armor and 10 or more mortar rounds for the Jackdaw ship. Travel to the legendary ship battle in the northeast corner of the map, with the two legendary ships that attack you. You will not be able to defeat both ships without your ship fully upgraded, but you will be able to defeat one if you complete the following steps. When the battle starts, shoot two mortar rounds at the ship you are focusing on while turning around, then release your fire barrels. When they get close, use your heavy shot. Do not get between the two opposing ships or you will quickly be defeated. Once they pass, keep shooting mortars at the ship you are trying to defeat while they are turning around. Repeat the previous steps until you destroy the ship you are focused on. Quickly pick up the loot from the destroyed legendary ship, or else the other ship will ram and sink you quickly. You will get 10,000 Reales and be able to keep it after you die. Repeat this process as many times as desired. Tip: This trick requires the cannon and/or shot upgrades; or upgrades to your chain shot and ram abilities. Also, the Brothers-In-Arms must not have been sunk yet. Start a battle with a group of ships, then sink one of them and ignore the other ships. Collect your loot, then intentionally fail. After respawning, the ship you sunk will also be back with its loot, and you will still have your previously collected loot. Repeat this process as many times as desired to earn 10,000 Reales each time. To reveal the location of all collectibles (Animus Fragments, Chests, Secrets, and Song Sheets) in the game, synchronize all the viewpoints. Tip: To get the West Indies Sea collectibles, you must conquer all Naval Forts. Search the indicated locations at the listed Coordinates on the world map to find all eight taverns and get the “Barfly” achievement. Simply walk up to the barkeeper at each tavern, watch a short cutscene, and defeat the bandits to unlock the tavern. You can see the taverns on the world map if you synchronize the viewpoints for the respective area. Search the indicated locations at the listed Coordinates on the world map to find all 13 hidden shipwrecks and get the “Seven Deadly Seas” achievement. Tip: Shipwrecks become available after completing Sequence 6: Memory 1. Go down and swim inside the Antocha shipwreck at the 630, 660 Coordinates. Once you look through the windows, you may see a Giant Squid take down a helpless whale. Go to the map near the entrance to the modern-day Abstergo offices. Two co-workers will begin talking about Chicago. They will talk about John from IT. The male co-worker will comment that whenever he requests help, John replies with “Have you tried turning it off and on again?”, which is a reference to the British comedy The IT Crowd. To get the “Hungover” achievement, keep drinking at a tavern until you pass out. A tavern can be found in Nassau, which is one of the first locations you will visit during the main story. Walk up to the bar, and interact with the bottle to start drinking. You have to drink at least five times to pass out. Killer whales can be found in the “Cruz” area of the ocean. Capture the fort of this area to see the killer whale symbol on your map. It is also recommended to upgrade the harpooning statistic of your ship by upgrading the harpoon strength and harpoon storage. Check your map for the fishing locations (one can be found at Coordinates 537, 340 on the world map), as they can vary. Fishing locations are highlighted on the ocean when you get close. Interact with one of these spots to start fishing. After a deck hand announces the presence of a whale, Kenway will be sent with a harpoon to hunt it. Once the killer whale appears, defend your boat and keep throwing harpoons at the whale until it dies to get the “Killer Killer” achievement. A great place to easily complete every activity in a single location is on “Florida” island, at Coordinates 409, 815. When you scroll over an island on the world map, you can see which activities it has to offer. Usually it offers some collectibles and viewpoints. Florida island has very few activities to complete. Synchronize the viewpoint, collect the two animus fragments, open the treasure chest, and pick up the bottle message to get the “Owned” achievement. Crafting the Hunter outfit will cost a total of 11,000 R. Go to any general store, and select the “Hunting Goods” tab. Purchase the Red Howler Monkey Skin for 5,000 R and White Jaguar Pelt for 6,000 R. Then, open the crafting menu, scroll to the very bottom, and choose the “Hunting Outfit” option to craft this outfit and get the “Redingote Up!” achievement. Tip: If you do not want to waste the money crafting the Hunter outfit but still want the achievement, simply save the game and back it up to a storage device (for example, USB flash drive) before crafting the Hunter outfit. After crafting it and getting the achievement, copy the saved game file back to the original storage device, and overwrite the current saved game file to retain the money you spent crafting the Hunter outfit. You can get the “Silence, Fool!” achievement at any warehouse. Warehouses are found at farms and have a restricted area around them (shown as red on the world map). They will be marked on your map if you synchronize viewpoints. One can be found in Nassau, at Coordinates 633, 784. Once you enter the restricted area, there will be an alarm bell on your HUD. Then, get noticed by an enemy, and wait for him to ring the bell. Quickly kill him with a melee attack when he starts ringing the bell to unlock the achievement. Tip: You can also do this at warehouses that have already been looted. The enemies will respawn after a while. To rescue pirate hostages by distracting enemies with dancers, you must allow some of your crew members to die. Board an enemy ship, and your crew should begin fighting. Many of your crew will probably die. Then, go to Kingston, and go to Coordinates 623, 172. There is a restricted area where two enemies are aiming at captured pirates. You can hire some dancers nearby, just up the street. Send the dancers to these two enemies. Once they are distracted, sneak behind them, and free the pirates to get the “Siren Song” achievement. If this event does not appear (even after losing a lot of your own crew members), fast travel to another island, and return later. First, craft all pistol holsters. You can buy the required crafting items from any general store (so you do not have to hunt down the animals on your own), if needed. Also, buy and equip the “Cannon-Barrel Pistol” for one-shot kills. Then, find a group of at least four enemies, walk up to them with the pistols selected in your weapon wheel, and press Y without manually aiming to have each shot kill an enemy and get the “Wild West Indies” achievement. Freedom Cry – Achieve 100% synchronization. Freedom Cry – Completed all missions.